Crabtree explains how its new Metalclad socket USB opens up charging solutions. The robust shape and composition of the new Metalclad dual USB socket-outlet makes it perfect to fit in a variety of applications, bringing a wider choice of USB socket outlets to the market. Meeting all relevant product standards, this latest socket outlet from Crabtree, one of Electrium’s leading brands in electrical components, is a 13A two-gang switched socket with double pole switching – with two USB ports providing a total of 2.1A. The durable finish of the socket thanks to its Metalclad features means it is resistant to premature ageing, discolouration and corrosion, keeping the socket looking as fresh as the day it was installed. Industrial sites such as factories, garages and workshops will benefit from its tough exterior, allowing users to plug in devices safe in the knowledge that its surrounding environment won’t affect its performance. Installers at educational facilities would also benefit from the advantages provided by the toughness of the socket. 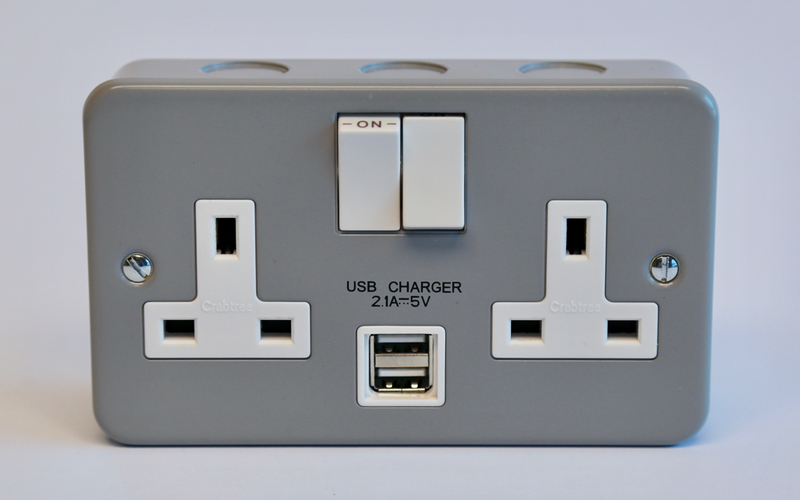 Find out information about Crabtree’s new Metalclad Dual USB socket-outlet on the website.